First things first, a hearty congratulations to all the pregnant women out there, nurturing a miracle within you. Although it’s a great feeling, it’s not an easy for all. You have probably noticed the growing belly and have trouble sleeping on your back, like you used to before. Waking up in the morning bring forth a whirlwind of aches! Most of which you are able to attribute to bad sleeping positions with a lack of support to the back and neck! Worry not, as here is a product that you should consider purchasing; especially if the above mentioned situations are a daily episode in your life these days. Yes, we are talking here about so called Pregnancy Pillows. Pregnancy pillow or a maternity pillow is a specially designed pillow to provide maximum support to the new size and shape of your body. It most importantly enable, a comfortable and trouble-free sleep period at the end of the day. Pregnancy pillows are much different than regular body pillows as these are well designed to suit with the curves and contours of your body at this time. Body pillows on the other hand are long and straight does not provide any extra support during this time. While it is a debatable topic – on which pillow you should purchase for your comfort, it would be advisable to not shun the entire idea of using a pregnancy pillow following the confusion of the decision making process. Here we will make all the process of choosing the best pillow type, easy for you. Regular pillows, even a bundle of them, when placed for support offer limited space for movement. And since pregnant women tend to move around a lot due to the uncomfortable sleeping position, the pillows tend to slide away and end up offering no support whatsoever. The following mornings could see you waking up with pelvic, hip, or lower back pains, all of which point to one exact thing; something has to change for a better tomorrow. Although some pregnant ladies prefer the regular pillows to the maternity pillows, a majority of women have claimed the best pregnancy pillows to be a life saver with better and sound sleep periods. Now when you know about the different types of pregnancy pillows, you need to choose the best ones that are most suited for your body requirement. Good idea for you is to opt for the combination of bed wedge as well as body pillow so that it continue to provide you the best support to your body all through the pregnancy time. For your help we list down some of the best options (in our- 10 best list). Check them out and hopefully you find your best pillow for pregnancy time among these. Made up of cotton (in United States), Comfort U body support pillow is a liberally oversized pillow. It is pretty long enough to help you stretch out while supporting either sides of the body when you are at rest. With this support pillow you can eliminate the turning and tossing while sleeping by keeping the shoulders, neck, back as well as hips really aligned, the entire night. The comfort U pillow also gives an ideal support for nursing, watching television and reading. It is filled with a premium fiber generally called as Fusion Foss fill which is a radical synthetic. The material is famous as a type of extended polymer that allows the free flow of air. The good thing about this U comfort total body support pillow is it will never lump, flatten or clump. You can enjoy tussle free sleep with the body support pillow as the whole body will be cuddled inside this pillow without much stressful movements. Good sleeps makes your day much better so its time for you to help yourself and your body with Comfort U. We are sure that your body will love it. Snoogle replaces the multiple pillows that pregnant ladies normally use to support neck, hips, tummy and back. The patented design of this pillow was developed by a registered nurse and a mom. The good part of using this pillow is that you can enjoy the comfort, cuddle and support without increasing the body heat. The Snoogle total body pillow comes with a sham-style cover that is removable and also is machine washable. The space inside the pillow can keep the body in one place without much movement thereby making the night’s sleep a good one. 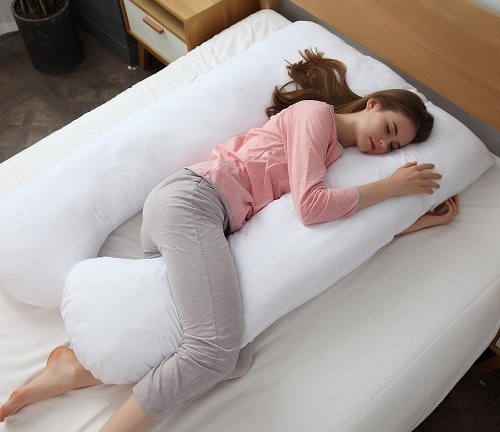 The pillow is relatively long and it can be even moved and positioned to provide extreme comfort to your body. Pregnant women love it as their hip, neck and all the other body parts gets complete support, thereby providing a good night’s sleep with all the comfort. Mothers to be can enjoy all privilege during their pregnancy with Snoogle body pillow. So why not opt for it and enjoy your pregnancy and day to day life with the comfortable total body pillow from Snoogle. Boppy Custom Fit total body pillow is created to provide maximum comfort for the mothers to be. The latest product is the newest version that is released in the market. This pregnancy pillow is designed to give head to toe support so that you get a good sleep without turning much. The unique contoured design of this pillow follows the entire body line to support belly, neck, hips and back. The pillow is machine washable and hence is easy to use. We believe that pregnant ladies need to have a peaceful sleep especially when their belly tends to grow during the pregnancy time, especially while third trimester. With this custom fit pillow the entire pregnancy period can be blissful. Additionally the cotton material of this pillow will control the body heat making it much comfortable for your body. The weight of the pillow is about five pounds and the manufactures warranty for this can be obtained through customer service. Opt for this awesome pillow and we wish you to sleep well with the Boppy Customer Fit body pillow. With a size of 60”L x 35”W x 7”H this U shaped premium pregnancy maternity pillow comes with one removable white zippered protector for enhanced longevity. The unique design as well as the shape of the pillow provide complete support both to belly and back during the pregnancy time. The design of the pillow helps to prevent heartburn, sciatica, nasal congestion and carpal tunnel in pregnant ladies. You can surely experience extra comfort while using this U shaped premium pillow as the inner contours are designed to follow the natural curved shape of your body. The product has been created to protect women in the best way possible by helping them to relieve pressure of pregnant belly. The best thing about the pillow is that you can also use it by tucking it between your knees, to elevate your head or to align your hips for relieving joint strain. With 30 day money back guarantee (in case you are not comfortable/satisfied with the pillow) it is worth to give a try especially to make your pregnancy period comfortable. Today’s Mom pregnancy pillow comes with a unique feature ie shoulder comfort system. It keeps the back of the mom to be cushioned and thereby keeps the baby completely supported during nursing. The inner curve of this pillow keep the mom’s back and also the belly supported. When it comes to pregnancy pillow it is the comfort of the mom that has to be taken into consideration. This Today’s Mom cozy comfort pillow for pregnant women has been designed to caress the natural curves of the body of the mom especially during the end term of the pregnancy. The shoulder support design and the curved shape is what makes Today’s mom cozy comfort pregnancy pillow one of the best and widely used. The entire body gets cradled and constant comfort is provided throughout the period. The total weight of the item is 10.1 pounds, the dimensions are 56’Lx 9’ W, 32” H and it comes with a manufacturer’s warranty. Oversized total body pregnancy pillow is meant to give complete support to the whole body of pregnant ladies in a most effective way. And thus it is considered as one of the best pillow for pregnancy. The pillow comes with a zipper cover for longevity and easy usage. It gives you a feel of 400 thread counts with hundred percent super soft microfiber polyester shell and fill. The measurement of the pillow is 19 inch thickness and 130 inches of length which makes it extra comfortable for maternity. The blowout bedding is an exclusive addition to this product range. This oversized maternity pillow is U shaped and you can sleep on it to prop your feet and head on. The pillow can also be made in the shape of L down the front portion and also under your leg. You can even can use it for your back or pull it under your leg to its front side. Overall this pillow gives you the freedom of using it in a customized way according to the level of comfort that you want from it. With a 30 day money back guarantee offer at Amazon, its worth trying out this soft maternity pillow. KHOMO extra light full body maternity pillow is one of the best solutions for your sleepless nights during pregnancy. As it gives complete support to the body and helps in keeping the spinal area properly aligned (in whatever position you choose to sleep), it delivers great comfort to give a feeling of you being surrounded in a cloud of complete bliss. Additionally this KHOMO pillow for pregnant ladies provides better comfort to the back and other related areas that have higher chances of getting pain. Moreover this Samay Comfort U-Pillow is an extra light pillow which is stuffed with the right quantity of high quality PP cotton which is hypoallergenic. This ensures that you get maximum cuddliness while resting. Another great advantage of using this U shaped comfort pillow is that it helps you to relieve various health conditions like fibromyalgia, congestion, back pain and even rheumatoid arthritis. For ease of use and the pillow is provided with a removable cover that has an on-off zipper cover. So why not HUG the pillow and cuddle yourself to enjoy most enjoying and uninterrupted sleep at night, which is a much needed thing for you during pregnancy time. PharMeDoc “C” shaped full body pregnancy pillow is another great pillow that can be checked out for your pregnancy time comfort and pain relief. It is not just a sleeping pillow but it actually folds around your body so that you will be able to take complete care of your new born in an easier way. Additionally this is one of the best pregnancy pillow for hip pain which allows you to rest in a comfortable position by supporting your back, knees, neck, head and hips all together. This comfortable maternity cushion by PharMeDoc provides full countered support system. The adjustable pollyfill material prevents you from tossing and turning while you sleep at night, making this pillow an ideal one during pregnancy or maternity period. The hundred percent cotton cover makes it softer to use. The zipper cover provided is removable and machine washable. It is completely hypoallergenic and comes with zero latex/lead. Also it is free of BPA. The PharMeDoc full body pillow comes with 5 years of warranty and work brilliantly towards providing you hundred percent satisfaction. The prenatal sleep wedge from Boppy is an awesome option for ladies who want to keep their baby safe especially during the prenatal period. The sleeping wedge comes with two contoured sides that helps in keeping the baby safe from rolling. The sleep wedge from Boppy is a versatile and firm cushion for belly and back support. The compact portable design means that you as a mom can put this wedge anywhere you loves it to be. The soft and comfort fabric will help keep your skin soft and give the needed warmth. This pregnancy wedge is made of fifty percent cotton and fifty percent polyurethane foam. It has a removable slip cover which can be machine washed. Additionally the durable quilted vinyl is provided which helps to resist any kind of moisture. Just try this prenatal sleep wedge from Boppy and we are sure, you will love using it. The Meiz maternity pillow is a total body support pillow which is designed perfectly for side sleeping. The U shaped ergonomically design gives best support to your back, neck, hips, knees and head along with 360°cuddle. The contours of the pillow are designed to follow the natural shape of your body which is curve shaped. As Meiz nursing pillow helps in relieving heartburn and nursing pain it relaxes you to give a wonderful sleep all through the night. It is also helpful in relieving several health conditions like fibromyalgia, sciatica, gastric reflux, carpal tunnel syndrome and congestion. This U shaped maternity pillow from Meiz improves blood circulation while at sleep. 100 % polyester filling and 100% cotton cover makes the pillow softer and even more comfortable. It is considered as a best drug free remedy to relieve your pregnancy pain. The product comes with a guarantee and is created to provide complete customer satisfaction. Pregnancy pillows for neck and back pain during pregnancy need not follow the principle of one for all, since various people tend to require various degrees of support and have varying favorite sleeping positions. 1- Pregnancy Wedge Pillow: This is one of the most used and cheapest pregnancy pillow solutions available. You can use these so called triangle pillows during early pregnancy. These are best suitable for your first and second trimester. Many to be moms prefer pregnancy wedges because they remain practical even after giving birth to baby. They could also double up as an ergonomic cushion chair, which says, you don’t need to be pregnant to use this pillow. 2- Full Length Pregnancy Pillow: Full length pregnancy pillows also known as body pillows are straight and run along the length of your body. While they are great to cuddle, they do provide less support for your back than other styles of pregnancy pillows. The advantage of the full length pregnancy pillow is that it is a single unit that stays in place. Full length pregnancy pillows are available in two different styles, the straight full length pregnancy pillow and Flexible full length pregnancy pillow. You can choose the one as per your requirement and body conditions. 3- Total Body Pregnancy Pillows: Total body pillow tend to wrap around the exterior of your body providing better superior support. They are designed to hug both the front and back of your body, thus providing extra spinal support. Generally around 5 to 6 feet in length these pillows are big enough for most people to feel comfortable inside. Total body pregnancy pillows are available in two different styles, the C shaped pregnancy pillows and U shaped pregnancy pillow. You can use it to ease the pain that is felt on body parts such as neck, shoulders, hips, upper back and lower back! 4- Pregnancy Pillow With Hole: Pregnancy pillow with hole for stomach sleepers and for massage is also a great option to check, especially when you want to lie down on your stomach and enjoy a great massage. These are specially designed inflatable pregnancy bed/pillow which comes with holes for providing maximum comfort to each and every body part (including stomach and breasts) of a pregnant lady. Products such as Cozy Bump Pregnancy Pillow and Earthlite Pregnancy Cushion are much popular and can be a great companion, all through your journey towards becoming a happy mom. Unlike regular body pillow, a pregnancy pillow helps brush away any unease with sleeping positions by providing the best support to your hips, neck, back, shoulders and legs. Its awesome design allows you to rest in the half-fetal position- a position that is highly recommended by doctors. Below mentioned are some among the numerous ways in which a maternity pillow can prove beneficial to you on the near and far views. Eases blood circulation: Pregnant moms tend to generally sleep on their sides as is advised by their doctors, so as to promote blood circulation. But this can prove challenging during the later stages, causing back aches, neck aches and joint pains. Various pregnancy pillows are designed to allow sleep on the back or the side providing ample support, softness and a cushioning effect, eliminating any discomfiture during sleep and soreness in the morning. Prevents body pains: Intense pain or numbness in the back, neck, knees, legs or hips is common during pregnancy. Studies show that 50-80% women experience a kind of lumbar pain throughout the pregnancy time and even beyond. If you are suffering from lower lumbar or pelvic pain or pinched nerve while pregnant, pregnancy pillows could prove to be a God-send. Longer sleeping time: Sleep and rest defines relief of stress and fatigue built up over time, and the pregnancy pillow with its primary objective of enabling a better sleep, helps longer and more comfortable hours of sound sleep. More rest helps better health for the mother which would help you to better prepare your body for the arriving baby. Useful after delivery: These pillows are not only useful during pregnancy as it can also be used post pregnancy to help position the baby for breastfeeding so that she learns to latch properly. Pregnancy pillow for office chair are also available in various varieties which can be used while working on office. These can prove much beneficial before and after pregnancy. 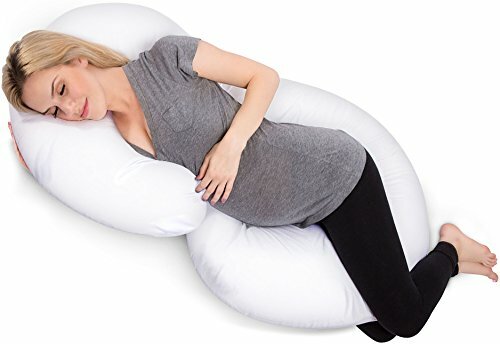 As seen above, buying a pregnancy pillow can ease of all the pain, discomfort and debilitating symptoms by providing you the correct sleeping positions. It not only makes you and your baby comfortable but also provides good safety by preventing various health complications. But as there are wide varieties and choices available, you need to know few more points before choosing the right pregnancy pillow for your back. 1- Material: This is one of the most crucial thing to check for. You need to carefully examine and research about the type of material it is made up of. The material of the pillow case fabric, its lining, the inner fillings, etc. should be checked cautiously so that your body does not suffer afterwards. Cotton pregnancy pillows are mostly recommended and preferred as they can provide the maximum comfort without irritating your skin. These are breathable, softer and cooler than any other material and therefore you need not worry about sweating out when you sleep closer to these, comfortably all night. 2- Shape and Size: With wide range of demand, pregnancy pillows are now made available in various different shapes and sizes. Many to-be-moms love sleeping close to u-shaped pillows while many other love hugging around v-shaped pregnancy pillows. Not only U and V but these are also available in rectangular, square, round, triangle, L shaped and C shaped. You can just pick the one or a collection of few, as per your requirement. When it comes to size, there is no one-size-fits-all pregnancy pillow available in the market. The average length of these pillows may range from 5ft to 9ft and you need to be careful about your requirement (especially if you are a taller woman) while choosing the one. The best way to choose is to go with the one that can provide you maximum comfort from head to toe. 3- Price: Comparing the prices and opting for an affordable most pillow does not work when you are in the market to buy a best pregnancy pillow. Although price is the foremost thing for many, we recommend that it should be your last important thing to check. As maternity pillow is a thing you may not need to buy again in your life, you should end up choosing the best that suits your body completely. Most of these pillows can also work as a nursing pillow therefore you would be using them continuously even after the delivery. So be smart and do not ever choose the pillow that is of low quality or uncomfortable to use. You would be wasting your money while buying a cheaper one, when you cannot use it comfortably.